We are very excited to announce the launch of our BRAND NEW PRO PLAN. The Pro Plans new tools will give you the ability to create more in depth moodboards to clearly communicate your vision to friends, family and clients. How can the PRO PLAN help you? 1. Our text tool allows you to add text and notes to your boards to communicate your intentions to your friends or clients faster. You can also use the text tool to leave your contact information, giving new clients an opportunity to discover you and your company. 2. Our new color scheme tool allows you to experiment with swatches to create full color schemes for your designs. You can test furniture and decor against a particular color background and experiment with various schemes until you are satisfied with the result. 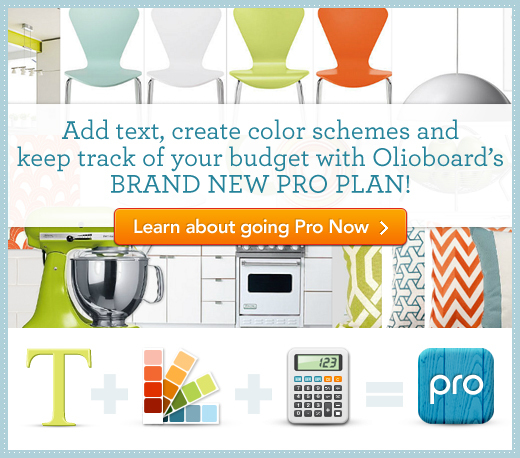 You can now easily incorporate multiple colour schemes in minutes for your clients to choose from. 3. Finally, our new budget tool allows you to compare the prices of the items you choose as well as keep track of your overall design budget. The budget tool comes complete with a print out shopping list of all the items in your design including the sourcing information for easy shopping, saving you time and money! For all you professionals out there – showcasing these detailed, budget specific moodboards on your blogs and sites will help give potential clients a clear idea of your abilities and further help promote your business. Give it a try and let us know what you think! Need a little help understanding the tools. Check out our tutorial page for a little insight.